The heart of Mecca Bingo all began in the UK. 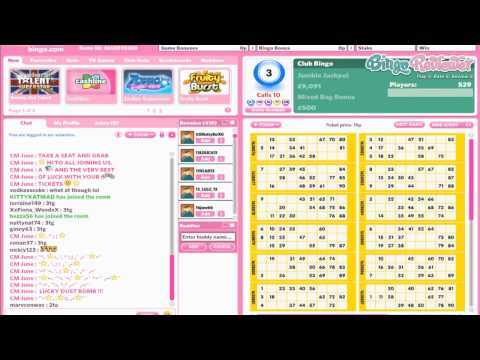 Having an enormously successful business in brick and mortar halls, they expanded to the online bingo community. The art of Mecca Bingo entertainment is the talent that is sweeping the UK by land and cyber space. Like the weather, something’s can’t be dependable. But as sure as the moon orbits the earth, Mecca Bingo is a predictable online experience that is the hub of UK bingo. Bingo is the name of the game and Mecca Bingo knows a thing or two about capturing a player’s attention just long enough to become their favorite destination. The homepage is bold in a magenta color scheme that makes a statement of a fearless bingo portal. You won’t need sunglasses from flashing blinding banners, instead a sleek simplicity that reminds us that less is more. With a name like Mecca there really is nothing grander and says it all. There are a couple of unique features at this site that are worth noting. Bingo players can share their Mecca Moments by creating a video and the favorite is rewarded with a nice cash bonus. Everybody has their favorite chat moderator and they are an important part of bingo room entertainment. Take the CM of the Month Poll and show your support by voting for your favorite. The highest vote getter will be the chat moderator of the month. Virtue Fusion powers this bingo hall with quality games. The software is a favorite in the European market drawing a large following of players. Mecca Bingo is regulated and licensed by the Alderney Gambling Control Commission and is part of the Rank Group. Players will find the best of two worlds with UK 90 ball bingo and American 75 ball bingo. For the player looking for something different, 80 ball bingo will fill the need for adventurous side. Along with the standard bingo rooms Mecca Bingo has unique rooms designed for special gaming like Deal or No Deal, Britain’s Got Talent and Superbooks. Mecca players are known for enjoying the slots and they have gone over the top with some of the most exciting slot varieties in the industry. The favorites include 50 Lions, Alice’s Wonderland and Casper’s Mystery Mirror. Play them all in demo mode and have a personal list of your favorites. Care to play Casino Games? If so there are table games that are among the most popular including Blackjack, Roulette, Craps and Hi Lo Dice. For more adventure in the gambling arena, Keno and Scratch Cards are there at your command. Mecca Bingo doesn’t fall short when it comes to Progressive Bingo and Slot Jackpots. Players who are going for the gusto and want big cash wins will find plenty to keep them busy for hours. The Bingo Daily Linx offers an incredible £8,000 of guaranteed jackpots with Sundays offering even more with £10,000 jackpots. A Free Bingo Room is offered to all newbie players that join Mecca and can win cash prizes all the while not spending a penny of their own money. It’s a great way to test drive the site before making a deposit. BOGOF tickets are offered on specific days and times. This is a bingo site with a heart and special promotions are randomly offered where a portion of the proceeds go to a charitable cause. Weekly and Weekend promotions are available so be sure to check the Promotions page for the latest incentives. Want to earn some real cash simply by playing bingo? It is super easy and all players have to do is purchase bingo cards with real cash and let the Bingo Bonus Points add up. These points are quite valuable and players can redeem them for cash. There is no doubt there is much to be said in a name and Mecca Bingo is a huge name in the industry. Besides bingo games, the slots are stellar with amazing themes including games that are found in many Las Vegas casinos. We rate Mecca Bingo with 4.25 Pink Hearts. I like the chat on this one, even though it probably isn't the nicest looking bingo site out there. They have really good 90 ball games daily, which can run upto massive weekly jackpots sometimes upto nearly 1 million. Mecca also have really good slot games as well as the bingo games. This site is very pleasing to the eye and has a great design. Not only that you could easy find your way and navigate through the site. But that is just the icing on its cake. What really keeps me going back to Mecca Bingo is the prizes... huge prizes! Been playing at Mecca since I was 35. I was a habitue of their halls because all my friends were there. I am glad that they have an online version where I check in once in a while. I've met quite a number of friends here, and the chat masters are really nice. So it's just like being at an offline hall with my friends! I think that Mecca has a lot going for them, but let's admit it, most players are there for the socializing and the big jackpots. And Mecca does not really disappoint on these two. I would really recommend Mecca Bingo to just about anybody, from beginners to experienced players. The site is easy to use and the prizes are to die for. They have a good community too. And they have a lot of instant games that can keep you entertained! I really enjoy playing at this site! They have a pretty interesting welcome offer going on. They will double your very first deposit between £5 and £50. So, if you make a pretty big deposit, you can get up to £50 free. I definitely started myself off by making a large initial deposit and so I was able to play for a decent amount of time for virtually free. I was able to pick out a couple of games I liked and get a feel for how they run. When it comes to their games, they offer both 90 ball and speed ball. Speed ball is actually one of my favorites. It’s a nice alternative to the basics. They also offer a really nice selection of slots which I tend to go for when I’m a little burnt out on the bingo. Overall, I like what they have to offer here and I would certainly recommend it to others. Decent looking site with the overall pink color, so I thought it was made mainly for girls. Well, the name Mecca doesn't suggest that, and have no worries, you will find a rather colorful and diverse community. The site is not that simple and clean, but you will easily find your way around, since all the links are clearly visible, but I still prefer a little less information on the landing page. They have separate iOS and Android apps and you can play all you want from your tablet or smartphone. I would just prefer the Android app is available through Play Store. Also, it seems they share the platform with Britain’s Got Talent Bingo. They host 14 different Bingo rooms and that is really admirable, with 75, 80 and 90 ball games, and that is nothing short of impressive. With a great set of promotions in play, this is the place you want to come back. They have a decent amount of bingo available here with a variety of rooms to choose from. In addition to the bingo, however, they have a variety of other games to take advantage of as well, along with a number of fabulous jackpots. They have a wide selection of slots as well as other games such as keno, blackjack, roulette and other casino games. Scratch cards can be found as well. Another thing I really like about playing here is the fact that they have a mobile site available. It is extremely easy to log on via any mobile device in which you can connect to the internet from. This mobile version makes it so easy to play all your favorite games from anywhere and at any time. This site has a lot of nice promotions as well. These include incredible giveaways, BOGOFs, free bingo, mobile cash back and much more! Mecca Bingo £500,000 End Of Year Party! New customers must deposit and spend £10 on bingo within 60 days to receive £30 bingo bonus with 2x wagering requirement and 20 free spins. T&C's apply.